A warrior; the son of Abinoam mentioned in Judges iv. 6, v. 12, as the most important ally of Deborah in the struggle against the Canaanites. Deborah summoned Barak, the son of Abinoam, from his home at Kedesh in Naphtali, and ordered him, in the name of Yhwh, to take ten thousand men to Mount Tabor. Here he was attacked, as Deborah had expected, by Sisera, whose forces were put to flight, and the greater part of them slain, by Barak's army. It is noticeable that Barak appears throughout as secondary to, and dependent upon, Deborah. For example, when directed to receive Sisera at Mount Tabor, he agrees to obey on condition only that Deborah should go with him. The fact that the honor of the expedition is given to Deborah rather than to him is not to be regarded as derogatory to Barak. It is merely another indication of his subordinate position (see, however, Moore, "Judges," p. 117). Barak joins in the song of triumph with Deborah (v. 1). 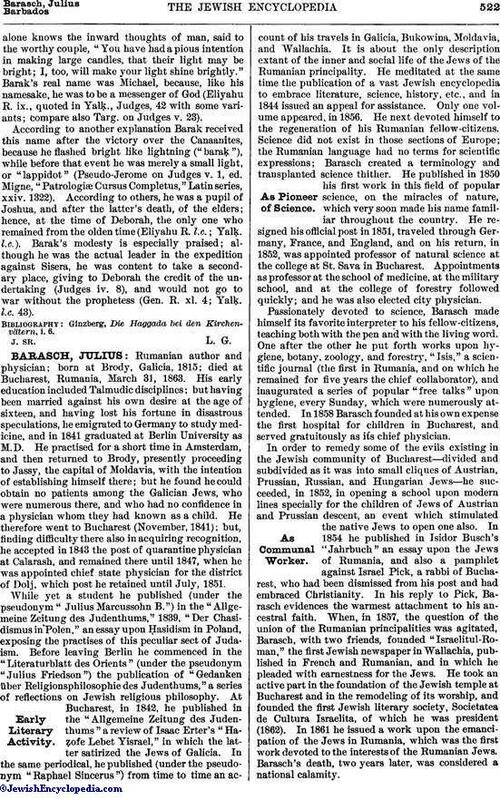 According to v. 15, Barak was probably a member of the tribe of Issachar. It is interesting to note that the name "Barak" occurs also in Sabean ( ) and Palmyrene ( ) inscriptions. 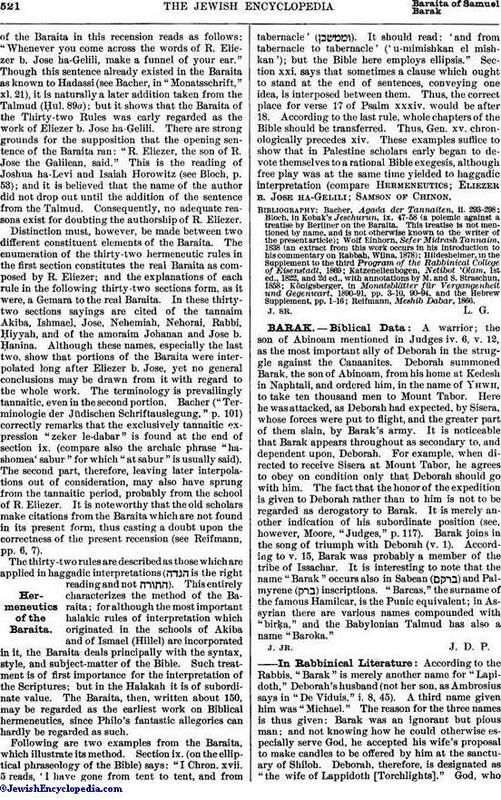 "Barcas," the surname of the famous Hamilcar, is the Punic equivalent; in Assyrian there are various names compounded with "birḳa," and the Babylonian Talmud has also a name "Baroka." According to the Rabbis, "Barak" is merely another name for "Lapidoth," Deborah's husband (not her son, as Ambrosius says in "De Viduis," i. 8, 45). A third name given him was "Michael." The reason for the three names is thus given: Barak was an ignorant but pious man; and not knowing how he could otherwise especially serve God, he accepted his wife's proposal to make candles to be offered by him at the sanctuary of Shiloh. Deborah, therefore, is designated as "the wife of Lappidoth [Torchlights]." God, whoalone knows the inward thoughts of man, said to the worthy couple, "You have had a pious intention in making large candles, that their light may be bright; I, too, will make your light shine brightly." Barak's real name was Michael, because, like his namesake, he was to be a messenger of God (Eliyahu R. ix., quoted in Yalḳ., Judges, 42 with some variants; compare also Targ. on Judges v. 23). According to another explanation Barak received this name after the victory over the Canaanites, because he flashed bright like lightning ("baraḳ"), while before that event he was merely a small light, or "lappidot" (Pseudo-Jerome on Judges v. 1, ed. Migne, "Patrologiæ Cursus Completus," Latin series, xxiv. 1322). According to others, he was a pupil of Joshua, and after the latter's death, of the elders; hence, at the time of Deborah, the only one who remained from the olden time (Eliyahu R. l.c. ; Yalḳ. l.c.). Barak's modesty is especially praised; although he was the actual leader in the expedition against Sisera, he was content to take a secondary place, giving to Deborah the credit of the undertaking (Judges iv. 8), and would not go to war without the prophetess (Gen. R. xl. 4; Yalḳ. l.c. 43). Ginzberg, Die, Haggada bei den Kirchenvätern, i. 6.